Yes, 2018 is shaping up to be another great year, and we’re starting the year off right with the return of our Swing into the New Year swing and big band music series. This series was a big hit in 2017, so we decided to do it again! 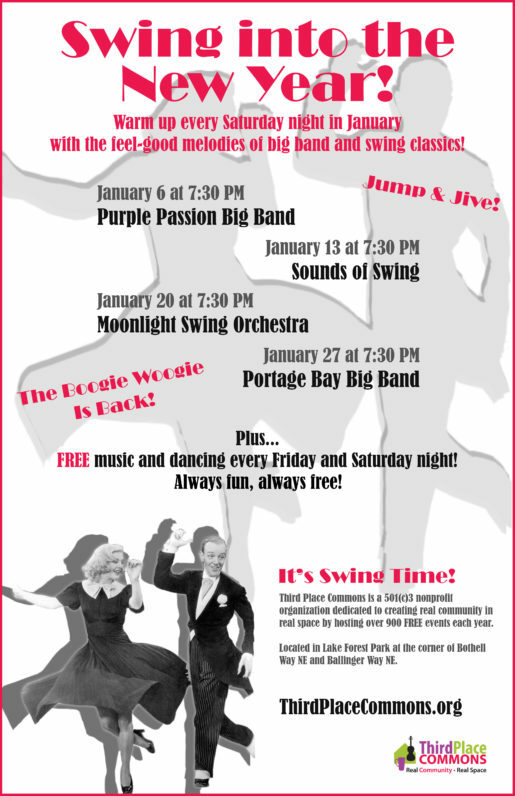 Every Saturday in January, join us for fantastic music and a truly jumpin’ dance floor with four of your favorite bands serving up an irresistible selection of American standards and big band classics. The perfect way to stay warm on chilly nights all month long, so mark your calendar and join us! And don’t forget about recurring events like weekly foreign language groups, game nights, tai chi, Mahjong Mondays, Kaleidoscope play and learn sessions, plus monthly events like Art-ins, Coloring for Adults, and Computer Q&As. So whatever you’re in the mood for, you’ll find something that suits at Third Place Commons in January. Check our online calendar for all the details and we’ll see you at the Commons! Previous Post: A Look Back at a Great 2017!